The lure of living in a stunning new home in a great location is proving irresistible to buyers at Taylor Wimpey’s sought-after Bridgefield development of houses for sale in Ashford, where homes are now selling at the rate of two a week. 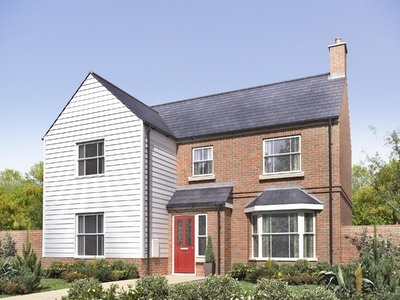 This has helped a quarter of homes to be snapped up by eager buyers from the popular current phase of the development, which comprises a beautiful collection of three and four-bedroom homes for sale in Ashford featuring the very best of classic architectural house design. Taylor Wimpey South East Sales Manager Kelly Dunn says: “The current phase of our Bridgefield development of new houses in Ashford got off to a flying start at the beginning of this year. “Now, as better weather arrives and we enter the ‘homebuying season’, the showhome is attracting no end of new visitors in search of property in Ashford who are keen to see how good life can be here. Customers coming along to Bridgefield can choose from a range of different three-bedroom house designs starting from only £154,995, while those seeking a four-bedroom property can choose the spacious ‘Thawkstead’ from only £269,995, or the magnificent ‘Midhurst’ from just £289,995. Offering superb versatility for individuals, couples or young families, the three-bedroom ‘Woodstock’ at plot 43 is an ideal first or second-time purchase. Priced at £172,495, this great-value home is characterised by a light and airy kitchen/dining room with plenty of space for relaxed family mealtimes or entertaining – and with French doors opening to the rear garden, it’s a room that’s perfect for enjoying sunny days too. The separate living room also features French doors to the garden, while the ground floor is completed by a handy store room off the kitchen and a guest cloakroom off the entrance hallway. Upstairs, the landing leads to two double bedrooms – one with en-suite facilities – plus a third bedroom/study which makes the ‘Woodstock’ ideal for parents with a young family, or for those who often work from home. Like all new homes at Bridgefield, the property is completed to a high standard specification, including double glazing, central heating and fitted kitchen with integrated oven, hob and hood. First and second-time purchasers can benefit from a range of special incentives when choosing a brand new home with Taylor Wimpey South East. Those stepping on to the property ladder can receive assistance with their deposit and legal fees on selected plots at Bridgefield, while Taylor Wimpey’s easymover programme provides customers with a property to sell an opportunity to reserve their new home and then sit back and relax while the housebuilder finds a buyer for their current property – and can also pay their estate agency fees. Incentives can be tailored to homebuyers’ individual circumstances and are subject to availability. Further details are available from the Sales Executive. Bridgefield is located against a semi-rural woodland backdrop, yet lies within easy reach of Ashford’s high street shops, boutiques, bars and leisure facilities, the Bluewater and Lakeside shopping centres, and rail connections to London and the Continent. A good choice of primary and secondary schools is also close by. To find out more about the homes now available at the development, visit the Sales Centre and showhome, located in Cheeseman’s Green Lane, Ashford, TN25 7EX, and open Thursday to Monday from 10.30am to 5.30pm.